Da Gadderie exhibition is open until 21 December. 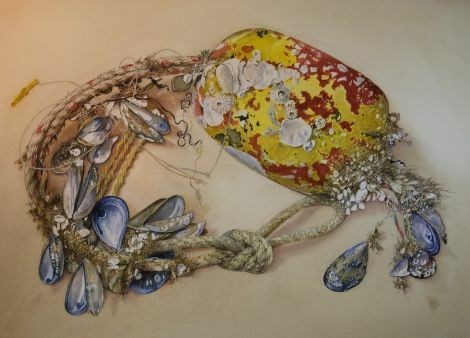 Perception, the latest exhibition at Da Gadderie, is an eclectic array of work from nine artists showcasing a diverse collection of paintings, basketry and pottery, writes Alex Purbrick. 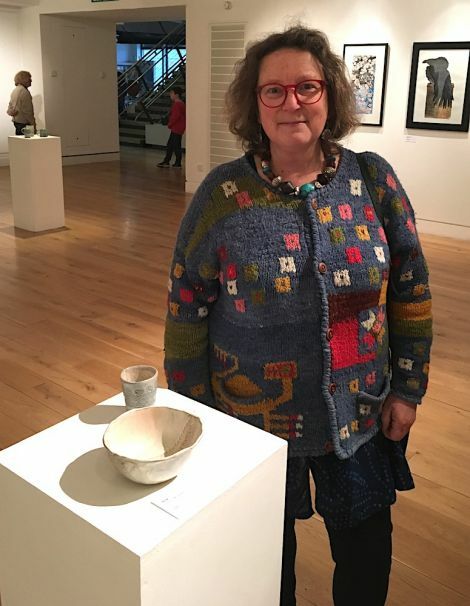 According to exhibition officer John Hunter, Shetland Museum and Archives had selected artists from the local area or artists with Shetland connections and brought them together. “The great thing about an exhibition like this is you’re never really sure what it’s going to look like. We ask each artist for roughly five pieces of work and then we have to collate them together to form an exhibition,” he said. The Cry of the Rain Goose by Paul Bloomer. Bert Simpson, who stems from Shetland but now lives in Orkney, uses watercolours to portray the ever changing light of the Northern seascape as well as a few paintings of natural objects such as feathers and wood that have washed up on beaches and become entwined with man-made materials like net, rope and marker bough. 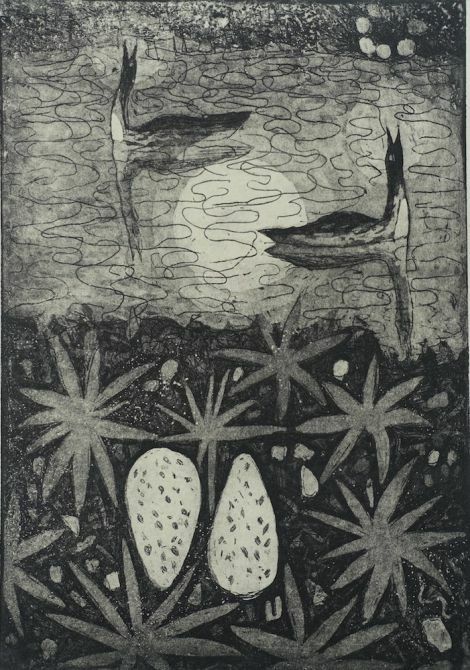 There are strong, bold woodcut prints from Howard Towll who is deeply inspired by the natural landscape and the myriad of animal life he encounters as he moves through the Shetland environment. “I love the shapes and movements of birds and the different aspects of bird behaviour, so I try to capture that. I’m really passionate about drawing things from life, observing it in real life not through photographs,” he said. The Winter Heron is a stunning print of a heron standing on ice covered rocks, the monochrome coldness of the ice and heron softened by the soothing blue of the winter sky. Another artist who is inspired by the birds he encounters on his daily ramblings through the Shetland terrain is Paul Bloomer. Through a series of etching prints he celebrates the return of the light in spring after Shetland’s winter darkness and how the birds praise this by a prayerful reverence towards nature. Inviting us to pause in our busy lives and reflect deeply into the colours of our surrounding scenery is Kristi Tait, whose vivid, vibrant abstract paintings remind us that the Shetland landscape is not just contained within the spectrum of greens and blues. Most of the artists in this exhibition are certainly enthused by the natural environment, encouraging us to perceive the diversity of light, life and colour encompassing our archipelago. Sometimes we forget about the minuscule objects of beauty lying at our feet. Using graphite and watercolour, Diane Garrick focuses on the miniature world of leaves and captures the autumnal tones infusing her walks through the small wooded areas of Shetland. She hopes her paintings will “inspire us all to look at nature and see the beauty in all stages of the natural life cycle”. 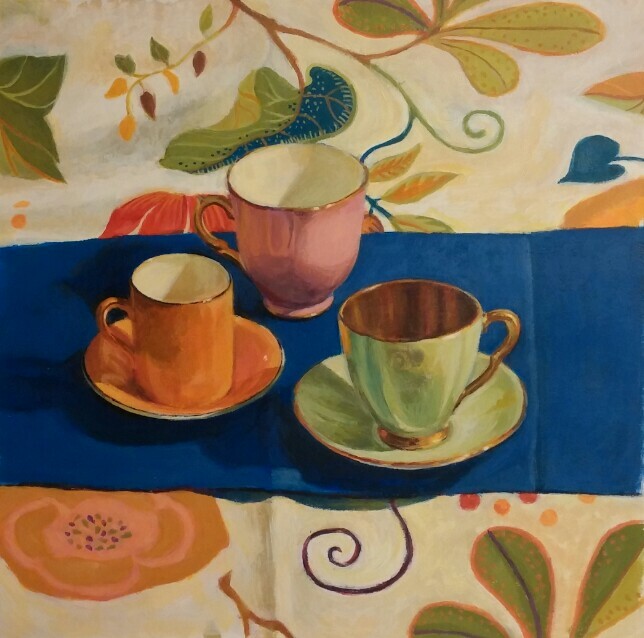 The small, everyday objects are not overlooked in this exhibition as Janice Armstrong depicts in her series of small, still life paintings, which colourfully reflect what she describes “the beauty of simple objects”. “We overlook so many ordinary objects around us and it’s good to pause and consider the hands that made them. I love colour and light and I want people to smile and enjoy them for what they are,” she said. The functionality of everyday items are a theme ceramist Sharon Mcgeady explores through a selection of mugs, wine cups, plates and butter dishes she has crafted from clay in her studio in North Roe. Another artist who responds to her environment is Vivian Ross-Smith who through a collection of small paintings portrays the everyday rhythms of island life inspired by weather and imagery. Interspersed throughout the gallery space is the unique, refreshing work of Lois Walpole who has created baskets from natural materials and pieces of plastic washed up on the beaches of Yell. One of her baskets has a melted lump of grey plastic which at first glance looked like a volcanic rock, but she has woven it into gladioli leaves to create a beautiful, functional object as well as an inspiring solution to reusing the plastic mountain that is deposited on Shetland’s shoreline by weaving them into the natural fabric of the local flora. Perception is on at Da Gadderie at the Shetland Museum and Archives in Lerwick until Friday 21 December.